Our skin specialists are trained to use state-of-the-art surgical therapies to treat numerous skin conditions. The choice of surgical dermatology procedure depends on the size and the site of the skin lesion, whether the skin lesion is suspected to be benign or malignant and whether it is superficial or it has infiltrated the deeper layers of the skin. Our surgical dermatologist considers all factors before recommending a procedure to treat your condition. Surgical excision is a procedure which is done under anesthesia by numbing the area with a local anesthetic before the doctor cuts the skin to remove lesions which are usually in deeper layers of the skin.Once the benign growth or skin cancer is removed, our skin specialists reconstruct the area with their expert skill to give you the best cosmetic outcome. These reconstructions take into consideration the size, shape and location of the wound to ensure you get the best functional outcome. Wound repair can involve a primary closure which is a simple side to side repair. It can also entail the use of a skin flap released from the side of the wound to cover it properly. In some cases, they can obtain healthy skin from another part of the body and use it as a skin graft to cover the wound. Skin biopsy is a procedure which involves removing a sample from a skin lesion and processing it by placing it in formaldehyde before sending it to the lab for evaluation. This examination is done to identify the cause of the skin disease and its extent. This is a relatively painless procedure since the area is numbed with local anesthesia.There are several methods for doing a skin biopsy and the choice depends on the size and location of the skin lesion. A shave biopsy which is done for superficial lesions while a punch biopsies or excisional biopsy may be done for deeper skin lesions. Skin cancers to confirm the diagnosis and determine the right treatment based on their extent. Mohs Micrographic Surgery is a special type of surgery for removing skin cancers. A mohs surgeon is a dermatologist who completed extra training in removing skin cancers that are large or close to important structures like the eyes, nose, ears, or mouth. 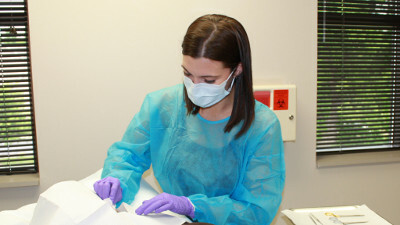 Mohs surgeons utilize a technique to minimize the amount of skin removed, while optmizing the odds that a skin cancer is removed completely and adequately.Dr. Sanford will refer you to a Mohs surgeon after she biopsies a skin cancer that requires this type of surgery. You will continue to see Dr Sanford for check ups after the Mohs procedure. If you have been referred for Mohs surgery, please follow this link for more information. It is important after having a surgical procedure that proper wound care is followed. A wound that is not well cared for is at risk for infections and may heal poorly. Improper care can lead to delays in healing and potentially scarring. Wound care instructions are different for each type of procedure and your should ask your doctor if you have any questions about how to care for your wound. The staff at Hancock Dermatology is well versed to help you understand the best way to take care of your skin after a procedure. Sometimes an appointment may be scheduled to check your healing after a procedure. If you are concerned your wound is not healing well, you should see your doctor. If you have sutures, an appointment 7-14 days after your procedure will be scheduled to remove the sutures. It is important to let the nursing staff or the doctor remove your sutures. Do not remove your sutures at home.